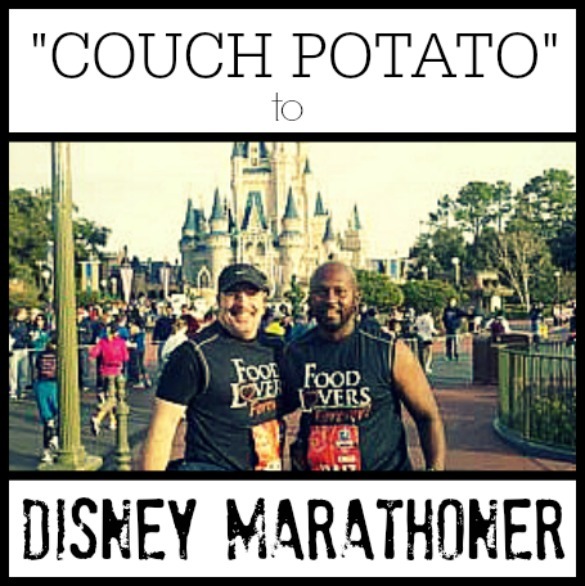 FBG Reader Goes From “Couch Potato” to Disney Marathoner! We get so many inspiring emails from readers, and this week we’re sharing a running success story with you! Read on for Paul Brown’s inspiring story of going from regular guy to Disney World marathoner, told in his own words through a Q&A. And feel free to share yours! 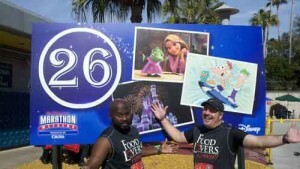 Why did you decide to run the Disney Marathon? When one of my sons (Joshua) was in 4th grade, (2000) he joined a running team at his elementary school. In order to connect with him, I started running as well. I had run in the Army but never knew that people actually ran long distances “for fun.” I also didn’t believe at the time that a little kid could run 3.1 or 6.2 miles—but he sure proved me wrong. After a race his 5th-grade year, my son turned to me and said, “Dad, do you think we could run a marathon?” I didn’t even know what a marathon was and when I found out it was 26.2 miles I thought, “You’ve got to be crazy!” But the thought always remained in the back of my mind. Fast forward to fall of 2007, and I am watching The Biggest Loser. This was the first season that the final four contestants ran a marathon at the end of the show. 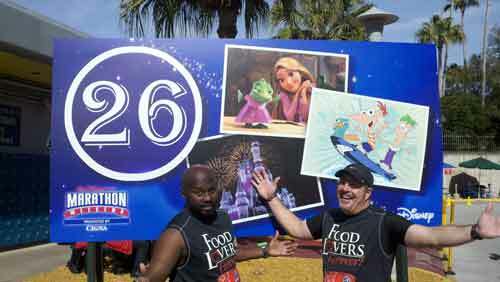 I watched in amazement as these contestants finished the 26.2-mile distance. I thought to myself, “If they can do it (and many of the contestants were still bigger than me at the time), then what’s my excuse?” The show has been a very big inspiration to me along my journey towards health and fitness. The guys make friends with Sueann Holly at the start. Now fast forward once again to December 2009. 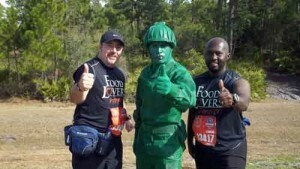 I watched The Biggest Loser contestants run a marathon again, but this time something was different. I had started the Food Lovers Fat Loss System in August of 2009 and had dropped 13 pounds by this time. I had also started to gain some strength by utilizing DVD workouts. So in December 2009, I set out to see if I could go 7 miles. 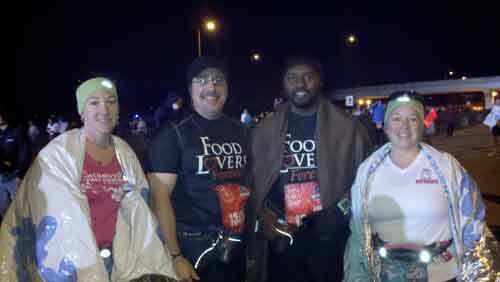 I was very apprehensive as I began the 7-mile challenge, waiting to see if my body would quit, but it didn’t. In fact, at the end of the 7 miles, I still felt great—like I could keep going and going. Mind you, I was using a run/walk/run method, but I didn’t care— I had finished 7 miles. Then in January 2010 I read a very inspiring post on this website by Jenn. I was so inspired by the blog, and it made me realize that perhaps I, too, could finish a marathon—and the Walt Disney World Marathon seemed to be the best choice for a first-time marathoner! Would you consider yourself “a runner” before training? What about now? Before August 2009, I was a total couch potato. In February 2010 I started using Couch to 5K program. After completing a 5K in March 2010, I went on to complete a 10K race in May. Then in May, I knew I needed to get serious about training for the half and full marathons, so I started talking to people on SparkPeople that run half and full marathons. I eventually settled on Jeff Galloway’s Run/Walk/Run method since I was already used to doing run/walk/runs. Today, I do consider myself a runner. I still use the run/walk/run method because I believe it gives me the best opportunity to complete longer distances and remain injury free, but “Yes! I’m a runner!” Don’t think so? Let’s go for a 26-mile run and just try to keep up! What was your goal for the race? My goal for the Walt Disney World Marathon was very simple: Just finish. I have read several times that less than 1 percent of the world’s population has finished a marathon. I am now part of that less than 1 percent and proud of it. How was the race? Did you reach your goal? The Walt Disney World Marathon was one of the most incredible experiences of my life. During the marathon, I felt a wide spectrum of emotions and feelings from jubilation to doubt, but the thing that made it all worth it was persevering and finishing even when you think you might not be able to at the time. Crossing the finish line after months of preparation and finally achieving that ultimate goal, well I just don’t know if there are words to describe how I truly felt. What is your best memory from the race? Does one mile stand out? There were so many great memories from the race, such as meeting fellow runners you didn’t even know prior to the weekend who become your best friends because of the journey you just took together. There is more than just one mile that stands out. Of course the first mile is so exciting and you are so ready just to get started and get going. Mile 10 to 11 was awesome, as we were running through the Magic Kingdom and there were all the opportunities to take photos with Disney characters and people cheering you on that it totally takes your mind off of what you are truly doing (running 26.2 miles). Around mile 15 another couple of runners (new friends) that we had been passing and then they had been passing us caught up to us and surprised us. They ran with us for a few miles and shared in our journey and encouraged us. Mile 21 was also incredible as we reached this hill that at a 21-mile mark you do not want to see. But at the top of the hill was the Sargent (Army Man) from the Toy Story movie hollering at us in only a way that a cartoon Drill Sargent can to “Get up that hill!” Can you say perfect timing? My most emotional moment came somewhere between mile 24 and 25, as we were nearing the end, tears started flowing down my face. Partially from pain, but also partially because after all this time I knew the goal was in reach and that I would accomplish something that 10 years earlier when my son had asked me to run a marathon, I thought was impossible. By the way, my son wasn’t with me in person on Sunday as he is now serving in the U.S. Navy, but he was definitely with me in spirit. Lastly, I don’t think I will ever forget posing for a photo at the mile 26 sign when you finally realize that victory is only 385 yards away at last. How do I define victory? Not by winning the race, but by finishing the race and overcoming the obstacles that stood in the way of getting there. Any tips for other beginning runners? Lots! 1. Yes, you can do it! Just take one step at a time. 2. Find a running buddy. A good running buddy is invaluable, and mine kept me going several times when I might have quit and given up. 3. Miles 21-26 are going to hurt. Your legs will hurt, your knees will hurt, everything below your belly button will hurt. Just keep going! 4. Don’t worry about your time. You don’t have to win a marathon to be winner, but finishing a marathon makes you a winner because you have now done something that 99 percent of the world’s population has never done. 6. Find a group of runners locally or a running group online. Their advice is invaluable, and their attitude is contagious. 7. Don’t give up. There may be trials, tests and setbacks along the way just like in life. Remember, you never really lose unless you quit and give up. 8. Announce to the world that you are running a marathon. This way you have to follow through and can’t give up. Too many people will be watching you and counting on you to finish and perhaps because of you they will be encouraged and inspired to overcome whatever obstacles they are facing as well. Will you run another race? Most definitely! In order to make sure that I would keep going, I had registered for a 15K Double Bridge run and another half-marathon. Now as far as another full marathon, I haven’t registered for another one yet and had you asked me between mile 24 and 25 of the Walt Disney World Marathon, I would have said you were crazy. However, there is just something about overcoming the obstacles, challenges and persevering that makes me know that I have another marathon in me sometime soon. Awesome Paul!! I will be run/walking my 3rd marathon this weekend (2nd time running Disney full) and can totally feel what you wrote about!! I know what I am in for, and am anxious and excited all at the same time! !